Dragonflies are predators with a history. They are some of the first insects to fly, starting about 300 million years ago. I was sitting on a pond hoping to catch a glimpse of a sora or a Virginia rail. I swatted the occasional mosquito but was pleased that there weren’t more of them. Hovering right in front of me was part of the answer why. Large dragonflies on the hunt zoomed in like attack helicopters, snatching mosquitoes and other small insects in midflight. Dragonflies, the original airborne insects, have been flying for over 300 million years. At one time, some ancestors were huge, with wings spanning over two feet. Today, the largest has a wingspan of about six inches and the smallest is less than an inch. Such a wide variation shouldn’t be surprising—there are over 5,000 known species of dragonflies. Without a doubt, dragonflies are voracious predators. Some of the larger species can eat several hundred mosquitoes a day, making them excellent as one of nature’s checks and balances. However, as ravenous as the adults are, the naiad or nymph stage is even more so. Naiads spend up to two years living in their birth water. There, they consume anything that moves. And that includes tadpoles and small fish. They are six-legged eating machines that don’t look much like the adult. When it comes time for the naiads to take to wing, they crawl out of the water and cling to a rock or branch. Their skin splits, and in one of the wonders of the world, a completely different looking creature, one with wings, emerges. As adults, they may live from one to six months—long enough to mate and continue the cycle. A few even migrate, and the globe skinner dragonfly holds the record among insects for migration—an 11,000-mile roundtrip across the Indian Ocean. Dragonflies have several specific advantages that make them such perfect predators. For instance, most of their head is made up of their huge compound eyes that allow them to see in any direction except directly backward. Coupled with incredible eyesight is an equally incredible ability to fly. Dragonflies are fast—up to 34 miles per hour for some of the larger species and they have cruising speeds between seven and ten miles per hour. 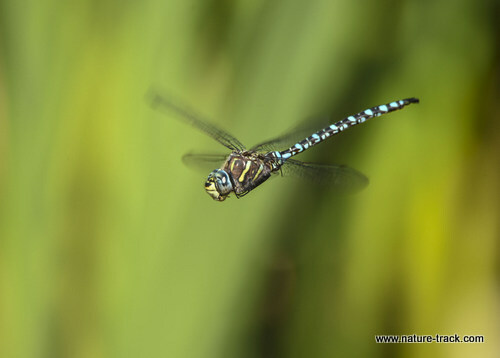 In addition to speed, dragonflies can fly up, down, sideways, forward and backward with equal ease because their two pairs of wings operate independently. I have always been cautious with that long narrow abdomen of a dragonfly. It seemed the perfect housing for a nasty stinger. However, dragonflies don’t have a stinger of any kind. They capture prey in the air, killing larger prey with a bite to the neck and eating smaller prey head first. Despite their formidable skills, they aren’t likely to bite humans unless handled roughly. There are insects belonging to the same order, Odonata, that look similar to dragonflies. These are damsel flies. They differ in several ways from dragonflies but the most obvious characteristic is wing position during rest. Dragonflies rest with their wings out to the sides while damselflies rest with the wings back over their abdomen. Dragonflies have probably saved me from hundreds of mosquito bites and for that I am grateful. I would be remiss though if I didn’t admit that I like having dragonflies around just to watch their 300-million-year-old acrobatic flights—something even attack helicopters can’t mimic.